It’s been a week since we started baby led weaning and it’s been a mixture of highs and lows. I’ve offered a whole range of food- fruits, vegetables, cheese, eggs, chicken, pasta, bread, peanut butter and hummus. There’s been successes and there have been complete failures (word to the wise: piri-piri hummus is a no-go). 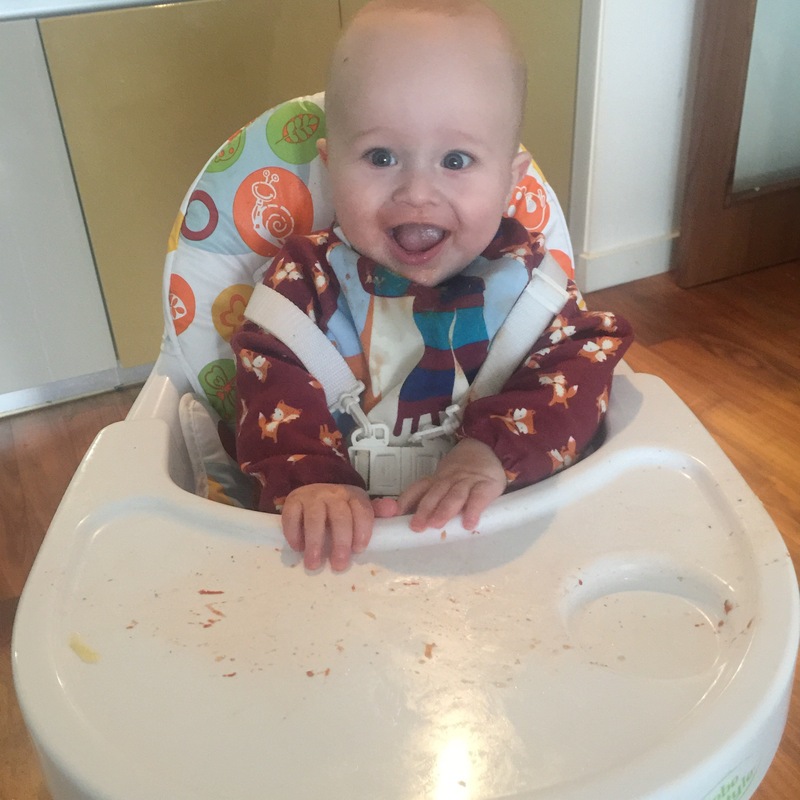 Here’s what I’ve learnt in our first week baby led weaning. I thought purees were messy. All that disgusting green slobber sliding out of Dex’s mouth and down his bib. It was about to get a lot worse. The majority of what I give Dex ends up on the floor via his chest, lap and hands. I am still trying to figure out a way to do this thing without having to change his outfit three times a day. I’ve tried a cover all bib and him wearing one of my old t-shirts but food still manages to find its way to be smushed on his legs. 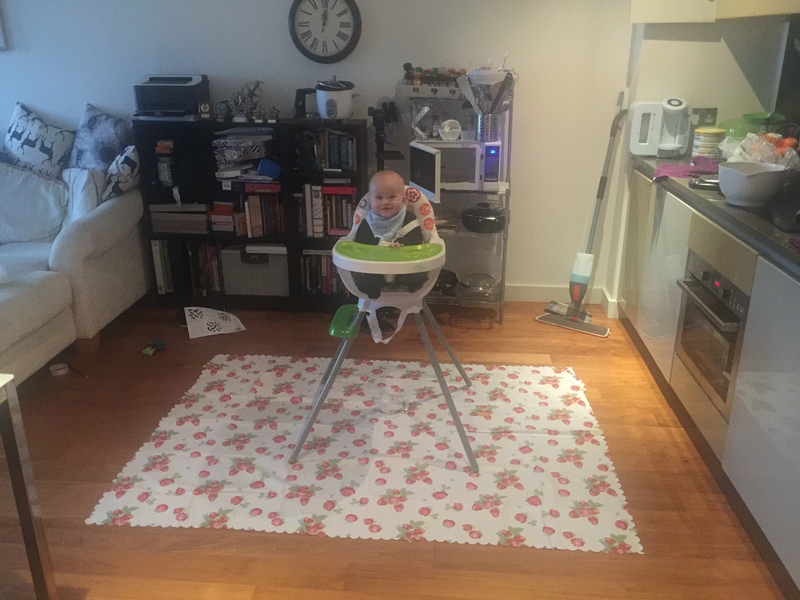 I decided to buy a plastic table cloth for the floor which at least means I can sweep up the bits of food without it getting trodden into the carpet. You need plenty of baby wipes to hand to clean messy hands and face after the meal. I’m dreading introducing something that is actually messy like spaghetti bolognese. Giving your baby a big bit of food and watching them shove the whole thing in their mouth? Scary. Then there’s the gagging. This, apparently is completely natural: babies have their gag reflex further forward in their mouths to protect them from choking. I have had to sit on my hands to stop me from forcing bits of satsuma out of Dex’s mouth. Research helps as well as being aware of exactly what needs to be done if a choking incident was to occur. I’m avoiding whole grapes, nuts and cherry tomatoes as these are big choking hazards and sticking to soft fruits like banana, avocado and steamed apple. I kept asking people what is good to offer my baby and kept getting the same reply: a little bit of what you’re having. Oh crap. I’ve stopped eating breakfast and although we eat pretty healthy teas, we are not getting anywhere near the recommended five portions of fruit and vegetable per day. Luckily, I already do meal plans for our evening meal so I have sat down and planned how we can incorporate a bit of extra veg into our meals. It’s quite easy to throw in a bit extra in most pasta dishes, curries and stir fries. I also offer an additional piece of fruit with every meal as well. It means I am eating satsumas for the first time in years- and I’m loving it! As I mentioned above, I’ve already started skipping breakfast again after becoming a porridge fiend during my pregnancy and there’s no way I’m having my tea at 4pm so Dex and I only share our lunch time meal together. I’m sure it’d be easier if it was summer, but right now, as soon as it goes dark at 4.30pm Dex wants his bedtime routine. I haven’t given him breakfast yet, I usually try some lunch around an hour after his second bottle of the day (11am) and then tea at 4pm which comes an hour after this third bottle. Dex likes a big nap after his morning bottle (7am) and I don’t want him to take less milk at his second bottle so I’ve avoided breakfast so far. I love creating new recipes and cooking, and watching Dex try all the new textures and flavours is amazing. I suppose I’m probably a bit off putting sat in front of him watching his every move with my camera but I don’t want to miss a thing. Despite all the worry and the mess, it’s so much fun to watch and I am so excited to see him develop over the next few weeks. I’m hoping he is going to start consuming a bit more and improve his pincer grip. Are you planning to BLW? I hope this helps you. Maybe you already BLW, what was your first week like? 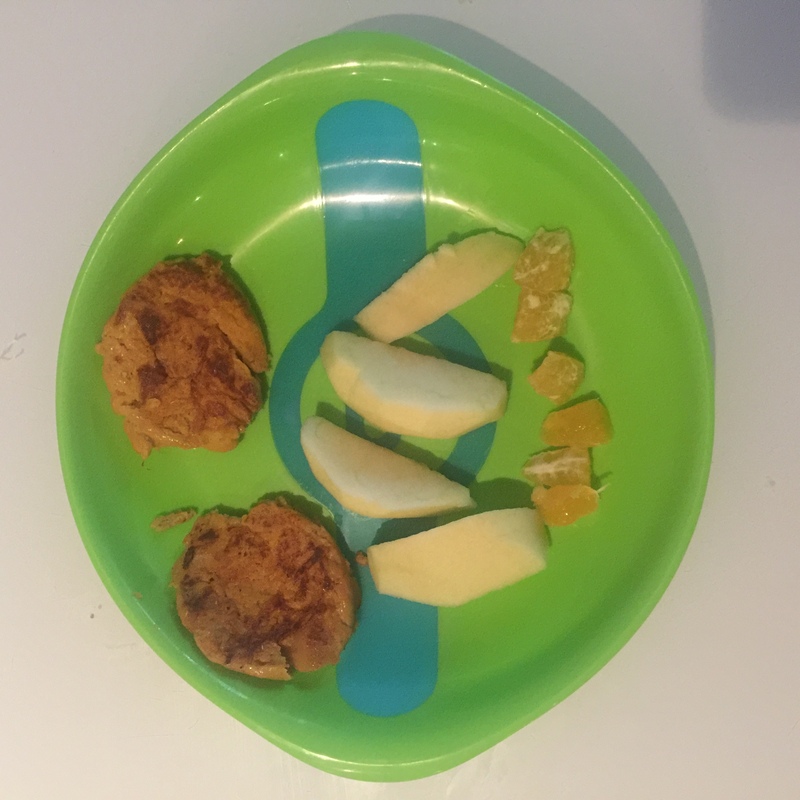 If you liked this post check out my guide to the must have baby led weaning products. I love BLW. Regarding the mess, I highly recommend eating in just a nappy followed by a quick sink bath, especially for spag bol nights! Much easier! Enjoy!